New Campomaggi handbags for Pre-Fall 2017, has their iconic rustic and versatile style with their distinct treatment of leather and rivets. Of the new collection, there is paint and studs, cotton prints, cowhide, simple leather, and grid leather patchwork and riveting. The Campomaggi leather patchwork and rivet leather handbag in particular is unique in its detailing, but remains classic. 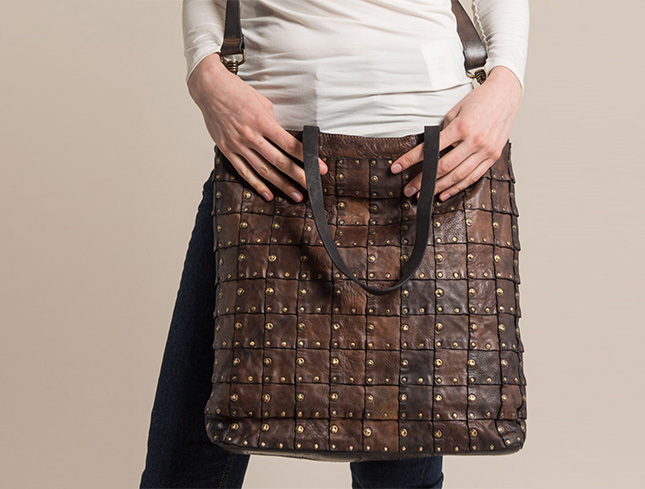 The bag is lightweight and remains wearable by not being overly shiny or over-the-top. The tones of brown and bronze melt together to create a bag that will last beyond passing trends. and in-store at Workshop in Santa Fe, New Mexico.